One of the key elements of a digital transformation is leveraging data analytics to deliver new insights for the business, increase the speed of execution and deliver competitive differentiation. In fact, IDC predicts that by 2020, 60-70 percent of Fortune 2000 companies will have at least one mission-critical workload that leverages real-time data analytics*. A modern data center must be built with solutions that can support these workloads as well as traditional applications, which are all driving new levels of performance requirements. That’s why I am elated to share that today we announced Dell EMC PowerMax: the world’s fastest storage array1. With end-to-end NVMe, a multi-controller scale-out architecture, a real-time machine learning engine and intelligent data reduction, PowerMax is the definition of Modern Tier 0 Storage. It’s designed to support mission-critical applications of today and tomorrow. PowerMax delivers unprecedented levels of performance of up to 10M IOPS2, 150 GB per second bandwidth and up to 50 percent better response times3. The multi-controller architecture is truly future proof with end-to-end NVMe built on cutting-edge technology based on industry standards that is optimized for Storage Class Memory (SCM) to maximize performance and agility. It features NVMe-based drives, NVMe-based Disk Array Enclosure and is NVMe-over-Fabric ready. Best of all, customers will be able to non-disruptively add Storage Class Memory (SCM) drives to their PowerMax array as soon as they are available early next year. PowerMaxOS unlocks the power of this system with a built-in machine learning engine that leverages predictive analytics and pattern recognition to analyze and forecast over 40 million data sets in real time in a single array4. This drives over six billion decisions per day to maximize performance with no management overhead5. It learns from patterns over time and recognizes changes in real time and rebalances data accordingly by placing it on the appropriate media type (SCM or Flash). 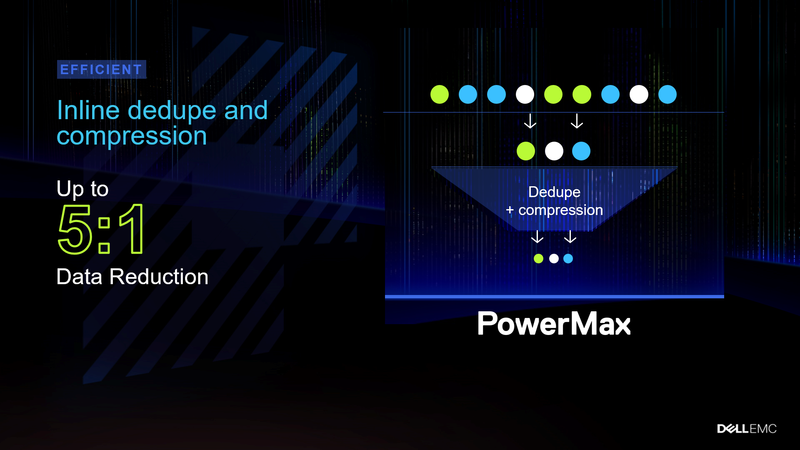 PowerMax also includes inline deduplication and compression to minimize storage footprint with up to 5:1 data reduction6. Compression and dedupe are hardware-assisted, selectable together and can be turned on or off at the storage group level for maximum flexibility. Plus, they are fully compatible with all data services with no performance impact. PowerMax arrays also provide 2x better rack density7 and 40 percent power savings8. 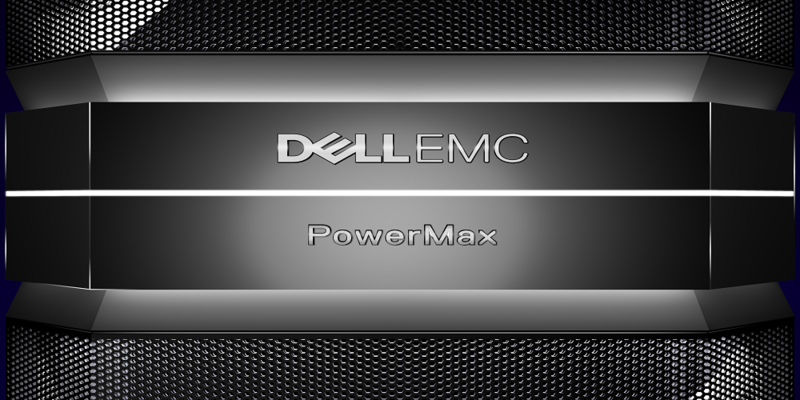 PowerMax is fast, smart and efficient – all without compromise. In addition to staggering performance, the latest cutting edge technology and smart machine learning, it is built on the foundation of Dell EMC’s flagship storage array. PowerMax will enable our customers to consolidate traditional apps including block, file, mainframe and IBM i as well as next generation apps like real-time analytics. It also provides world-class availability, unmatched data protection and security, as well as massive scalability. 2Based on Dell EMC internal analysis of Random Read Hits Max IOs Per Second (Within a single array) for the PowerMax 8000, March 2018. 3Based on Dell internal testing using the Random Read Miss benchmark test in March 2018, comparing the PowerMax 8000 against the VMAX 950F with SAS Flash Drives. Actual response times will vary. 4Based on Dell EMC internal analysis of PowerMax 2000/8000 with 200TB of capacity, March 2018. 5Based on Dell EMC internal analysis of a single PowerMax 2000 or 8000 array, March 2018. 6Based on Dell EMC internal analysis of dedupe and compression for a PowerMax array, March 2018. Actual data reduction will vary. 7Based on Dell EMC internal analysis comparing maximum capacity per floor tile of the PowerMax 8000 against the VMAX 950F, March 2018. 8Based on Dell EMC internal analysis, March 2018, comparing a fully configured PowerMax 8000 vs. a fully configured VMAX 950F. Actual power savings will vary.